This section has information needed to pass the CDL knowledge exam for driving a tank vehicle. (You should also study Sections 2, 5, and 6.) A “tank vehicle” is used to carry any liquid or gaseous material in a tank that is permanently or temporarily attached to the vehicle or chassis. However, this does not include portable tanks with a rated capacity of less than 1,000 gallons. Before loading, unloading or driving a tanker, inspect the vehicle. This ensures that the vehicle is safe to carry the liquid or gas and is safe to drive. Tank vehicles have special items that you need to check. Tank vehicles come in many types and sizes. Check the vehicleʼs operatorʼs manual to make sure you know how to inspect your tank vehicle. Vehicles must be purged of hazardous materials 48 hours prior to testing with documentation verifying the purge. Tank body or shell for dents or leaks. Intake, discharge and cut-off valves. Make sure valves are in correct position before loading, unloading or moving the vehicle. Manhole covers and vents. Make sure covers have gaskets and that they close correctly. Keep vents clear so they work correctly. Make sure you know how to operate your special equipment. Check the emergency equipment required for your vehicle. Find out what equipment you are required to carry and make sure you have it (and it works). Hauling liquids in tanks requires special skills because of the high center of gravity and liquid movement. A high center of gravity means that much of the loadʼs weight is carried high up off the road. This makes the vehicle top-heavy and easy to roll over. Liquid tankers are especially easy to roll over. Tests show that tankers can turn over at the speed limits posted for curves. Take highway curves and on-ramp/off-ramp curves well below the posted speed limits. Remember: A vehicle inspection needs to be performed daily. This should be memorized as it is frequently asked on the written exam. You must purge all tankers within 48 hours of hauling hazardous materials and you must have proper documentation of the purge. Remember: Tankers have a higher center of gravity, making it easier for them to roll over. In addition, fluids will shift to the outside of the turn, further increasing the rollover risk. Posted speed limits for curves are not designed for tank vehicles. Hauling liquids in tanks requires special skills because of the high center of gravity and liquid movement. 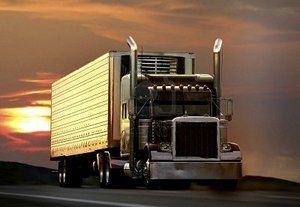 A high center of gravity means that much of the load's weight is carried high up off the road. This makes the vehicle top-heavy and easy to roll over. Liquid tankers are especially easy to roll over. Tests how that tankers can turn over at the speed limits posted for curves. Take highway curves and on-ramp/off-ramp curves well below the posted speed limits. A "tank vehicle" is used to carry any liquid or gaseous material in a tank that is permanently or temporarily attached to the vehicle or chassis. However, this does not include portable tanks with a rated capacity of less than 1,000 gallons. On all tank vehicles, the most important item to check for is leaks. Check under and around the vehicle for signs of any leaking. Do not carry liquids or gases in a leaking tank. While there are many other items which can be considered the "most important", most state manuals specifically state that checking for leaks is the most important inspection.